By now, you’ve probably heard that sealing the ductwork for your forced-air heating (and central air conditioning) system can save energy and money. Well, it’s true, no matter how old your house is. Admittedly, this rather tedious job falls in the category of "Unsexy Home Energy Improvements" (right below weatherstripping and attic insulation). But unlike high-profile upgrades, such as triple-pane windows and solar panels, sealing ductwork can yield some fairly big savings without an astronomical upfront investment. It’s also easy to do yourself, since it’s pretty much like icing a cake with your hands. One of the main reasons ducts leak is because they’re simply (and sometimes poorly) constructed. A standard duct system is made with sheet metal held together with screws, which means it’s not a whole lot different from the gutter system on the outside of your house. Sheet metal is a good material for moving air, but all the joints, fittings and seams leave many opportunities for air leaks to develop. An improperly balanced system compounds this problem by creating unnecessarily high positive and/or negative pressure in the ductwork. Another cause of big leaks is shoddy workmanship, whether it’s the fault of the original installer, a remodeler or the homeowner. Fittings and seams that aren’t fitted or fastened properly may leak from the beginning or come loose over time. Some of the biggest causes of leaks are repairs or “seals” made with duct tape. You read that right. Ordinary duct tape isn’t made for ducts; it dries up and can begin falling off ductwork within 6 months of application—maybe enough to get you through one heating season, but that’s about it. The simple answer to this question is: Air naturally finds its way out of anything that isn’t airtight. It does this because it’s constantly seeking balance in both pressure and temperature. Warm air moving through a duct in a cold crawlspace is just waiting for a chance to slip out and mix it up with the cold air outside the duct. To put it another way, air is a master of mingling, better than any socialite at a benefit dinner. Adding pressure to the system—that’s the force in “forced-air”—only makes the air work harder to find a way out. A forced-air system circulates air through the house via supply and return ducts. Supply ducts bring hot air from the furnace (or cold air from the AC system) to the heat registers in each room. The return ducts pull cool air from the rooms and bring it back to the furnace for reheating. Therefore, it’s important to seal all your ducts, not only to prevent the loss of heated air but also to improve air circulation and maintain a proper balance of the system throughout the house. The best stuff for sealing ducts these days is duct mastic, a water-based adhesive you simply slop on and spread around with your hands. Once the mastic dries, the seal is complete and shouldn’t have to be tampered with again. For spanning large gaps, cover the gap first with self-adhesive, fiberglass-mesh drywall joint tape. This comes in rolls and is cut easily with a sharp utility knife or scissors. You might also need some small sheet metal screws to replace any original screws that are missing or add some where the installer was neglectful. If you have any questions about what should be sealed and what should not, consult an HVAC professional (or at least a knowledgeable neighbor). For example, you should never seal any parts of the air handler itself or the furnace’s flue pipe, which looks like a small duct. 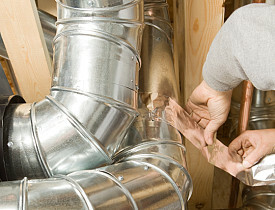 You can also have your ducts sealed by a qualified HVAC contractor or a duct-sealing company. One professional service uses a special adhesive that seals holes from inside your ducts, a good option for any inaccessible ductwork that runs through walls or between floors and finished ceilings. Weiner adds, “Assuming a homeowner can reduce energy use for space heating by 10 – 25% by sealing ductwork, the average homeowner could save $40 - $100 per year.” Note that sealing ductwork not only saves energy during the heating season; if you use central AC, it will save you money during the cooling season, too. And thanks to the improved system performance, sealed ducts help reduce the workload on your (expensive) heating and cooling plants—that is, your furnace and AC unit. While this isn’t really a measurable factor, mechanical equipment tends to last longer and require less maintenance when it’s working efficiently. If you really want to know how much you'll save by sealing your ducts, have your duct system tested by a home energy auditor or HVAC pro with special pressurizing equipment. Similar to a blower door test, duct testing equipment uses a fan to pressurize the duct network and detects leakage by how much air flow is present. By doing the test before and after you seal your ducts, an operator can calculate how much energy, and therefore money, you’ll save in an average year.